Using a body scrub is honestly sometimes the best part of our day. We’re not saying those days are awful or anything, it’s just that body scrubs are that good. It’s like being perpetually in the honeymoon phase, already starting to miss it even when we’re using it. Sorry for the public display of affection, but we think everyone’s going to want to feel this love, and ultimately, their own baby-soft skin! C & the Moon’s Malibu Made Body Scrub hasn’t been around for long, but it’s already making a huge impact in the beauty world. When one of the top beauty icons in the world, Kim Kardashian, uses a product, we know it must be the best of the best. 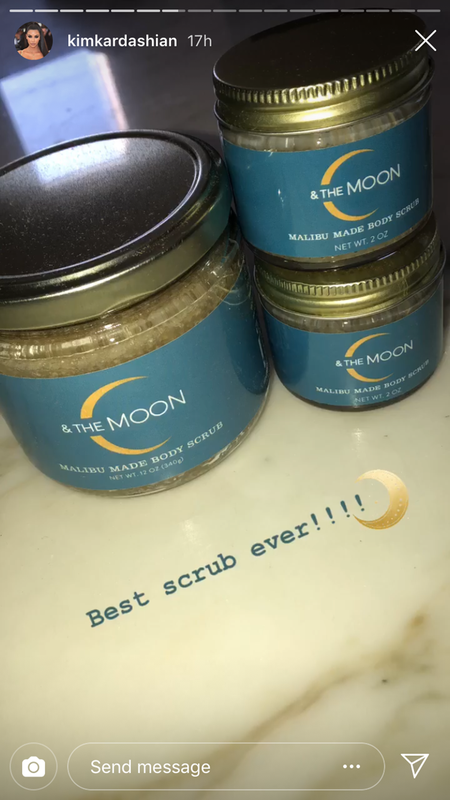 That was only confirmed in Kardashian’s recent Instagram story when she called it the “best scrub ever,” showing off three jars! We always trust Kardashian’s skincare opinions, especially since the reality star has been so open about her struggles with psoriasis for years. She’s not the only celebrity obsessed, either! See it: Get the C & the Moon Malibu Made Body Scrub for just $64 at Violet Grey! Kardashian’s mom-ager, Kris Jenner, is also a big fan of this body scrub, calling it “amazing.” That family knows their stuff. January Jones has also expressed her love for this scrub, saying that after using it, her skin “smells like a cookie” and feels like “silk!” It’s formulated with brown sugar and scented with food-grade vanilla, so Jones’ assessment is dead on. C & the Moon was founded by Carson Meyer, a former doula who wanted to figure out how to care for sensitive skin without all of the harmful chemicals, all the while staying environmentally conscious. She developed this scrub in her very own kitchen, experimenting with organic ingredients she already had to form an all-natural body polish celebs and skincare lovers are now pining over! This is a sugar scrub, but it’s made to be very gentle for exfoliation that helps us glow (and not bright red). It claims to be “ultra-moisturizing,” using three of the skincare industry’s favorite oils: coconut oil, sweet almond oil and jojoba seed oil. These three may work together to “help heal dry and inflamed skin, replenish elasticity, and clean blocked pores.” All while feeling amazing on our skin. This scrub also has Alpha Hydroxy Acid, better known as AHA, which is a chemical exfoliant. By using this mix of AHA and the physically-exfoliating brown sugar, we may end up feeling rejuvenated, as cell regeneration may be hastened to leave us with “supple, smooth” skin. This scrub also features castor oil, which claims to “minimize the appearance of blemishes and pigmentation.” So, we’re not only using this scrub to slough away dead skin, but to clear up blemishes and unevenness, too! To use this body scrub, all we do is take a handful and massage it in gentle, circular motions around our skin. Rinse and that’s it! The shelf life is one full year, which is wonderful for an all-natural product. Even after we’re all out, though, don’t toss away the jar! It’s made of glass with an easy-to-peel label so that we can repurpose it, using it as a planter, a keepsake holder or maybe as a container for some homemade salsa! We like mango in ours, but it’s all up to our individual taste. Since C & the Moon uses only all-natural, organic ingredients, it doesn’t come as a shock that the brand doesn’t use any parabens, phthalates, GMOs, gluten, dyes, heavy metals, phenoxyethanols, SLS, SLES or synthetic fragrances in this scrub. Only the good stuff. Kardashian’s approval was more than enough for Us, but if we want that extra reassurance, don’t worry. Because this scrub is sold by Violet Grey, which means it was approved The Violet Code. It was discovered and tested by artists, experts and big-name influencers, only being added to Violet Grey’s selection after meeting every standard. If we get caught stroking our arms all throughout the day, don’t be weirded out. Just know that this scrub made its way into our shower routine and we actually cannot get enough! Looking for something else? Check out more body scrubs and exfoliators here and more bath and body products available at Violet Grey here!